MOBERLY, Mo. — Central Christian College of the Bible head men's basketball coach Jack Defreitas on Thursday announced the signing of Keshawn White for the 2018-19 season. White is the fifth member of the Saints' 2018 class. 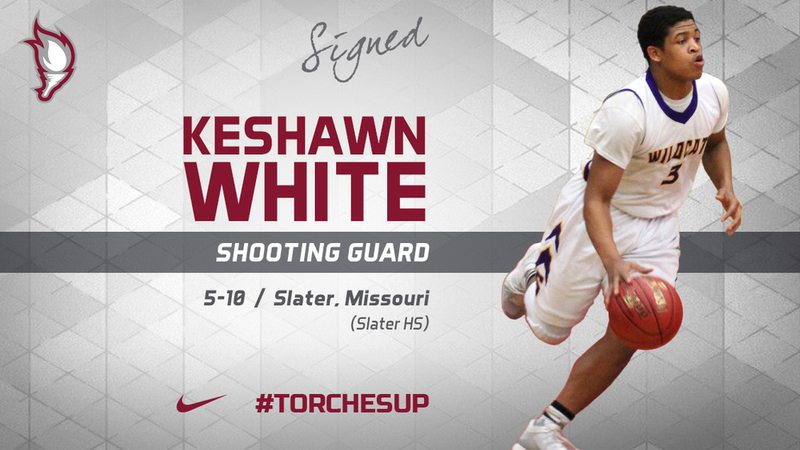 White, a 5-10 shooting guard, is a 2018 graduate of Slater High School in Slater, Mo. The four-year starter was a stat-sheet stuffer this past season, averaging 20.1 points, 8.1 rebounds, 2.3 steals and 2.3 assists per outing. White was named to the Class 1 All-State team in March after leading the Wildcats' to the state quarterfinals in 2018. Additionally, he was an all-conference selection for the fourth consecutive year, as well as earning all-district and KRES All-Star honors as a senior. "Keshawn is a tremendous talent and I am thrilled to have him joining us in the fall," Defreitas said. "He plays the game hard and is a physical player, which is exactly what we need. He drives and finishes around the rim as well as any high school player I saw this year." Slater won just 16 games during White's first three seasons in high school, which included a 1-24 season in 2014-15. As a senior, he led the Wildcats to a 17-13 record, including their first playoff appearance in 17 years. Despite missing some time due to injury, White scored 30 points or more on four different occasions in 2017-18, including a season-high 38 against Glasgow on Dec. 1. White plans to pursue an Associate of Professional Studies degree while also earning a Bachelor's degree in Education from CCCB's partner institution, Hope International University. White joins Luis Garza of Mission, Texas, Cruz Mendoza of Alton, Texas, Trey Black of Choctaw, Okla., and Ian Denton of Cairo, Mo., as members of the Saints' 2018 recruiting class.